The plantar fascia is a thick band of tissue on the underneath of the foot that runs from the heel to the toes. It helps to support the arch of the foot and provides shock absorption when walking and running. 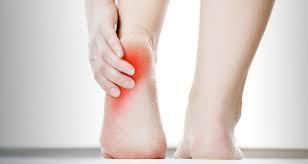 The increased load on the plantar fascia causes thickening, inflammation and tightness through the tissue. This causes pain being felt at the heel and if not treated the symptoms can increase. Our physiotherapists will conduct a full biomechanical assessment in order to determine which structures in the leg, ankle and foot are contributing to the condition. This will then allow a targeted treatment plan to be devised and advice will also be given on how to reduce the load through your feet. If you are a runner we can also structure a graduated return to running program.